Of all the stars in the Carnatic music galaxy from the 1930 through the 1980s, there was one star that outshone the brilliance of the rest the irrepressible genius S Balachander who stormed into the prim Madras music scene with a panache and eccentricity that no contemporary of his could match. 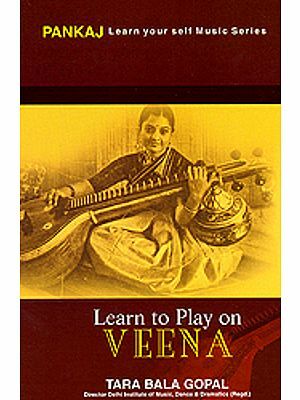 The Veena maestro began his music career at a time when stalwart vocalists ruled the roost and instrumentalists played second fiddle to them. But being an independent minded and self taught artiste Balachander carved a unique niche for himself as a veena soloist. He boldly changed the grammar of instrumental music contemporized the veena and created a legacy known as the Balachander bani or style. The multifaceted musician was also an acclaimed chess prodigy and a pioneer in Tamil Cinema. 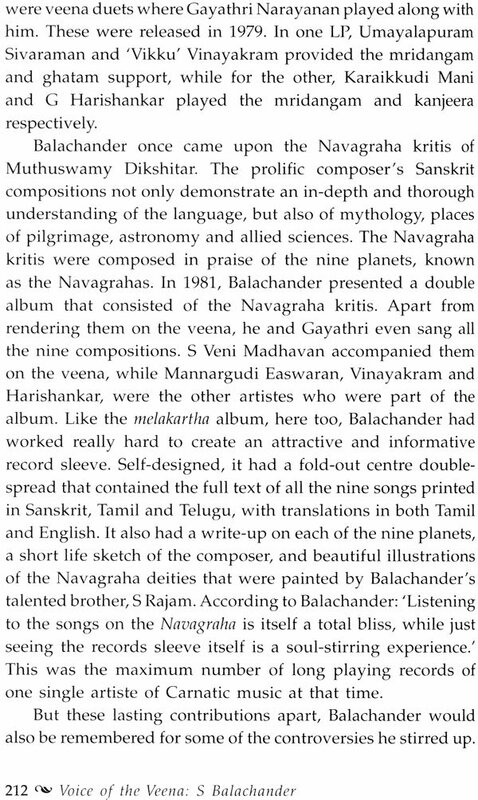 But Balachander’s iconoclastic and brash ways earned him the ire of the Carnatic music fraternity. He was quick to pick quarrels with established fellow musicians in his lifelong quest for perfection and truth. So was balachander a beloved genius or a much maligned maverick? The book attempts to recreate the towering personality that he was a lot of this researched from his elaborate personal diaries. While his death in 1990 created a void in the Carnatic realm the issues he fought from remain relevant till date and his memory lives on in the minds of music connoisseurs. As the maestro himself would have smugly said veena is Balachander, Balachander is Veena. 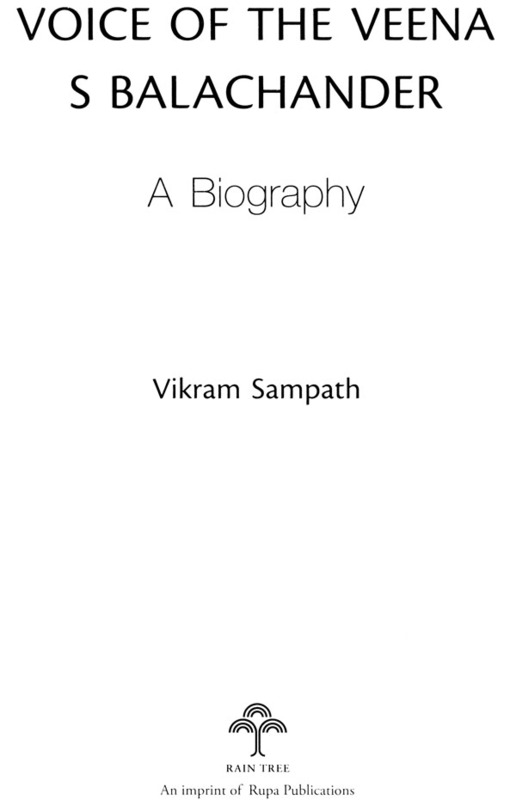 Vikram Sampath is the author of two acclaimed books splendours of Royal mysore. The Untold story of the wodeyars and My name is Gauhar Jaan! The life and times of a musician. He was awarded the prestigious visiting fellowship at the Wissenchaftskolleg in Berlin where he researched the early gramophone recording of Indian music. The author is an engineer mathematician from BITS Pilani and an MBA from SP Jain Mumbai. He is also a trained Carnatic vocalist and writes regularly for newspapers and magazines. He currently works in a leading software company in Bangalore. My introduction to S. Balachander was through a patriotic song I watched on Doordarshan as a young boy. The song was Baje Sargam and was supposed to be a tribute to the nation from the Maestro of Indian classical music and dance. Towards the end of the promo came an ageing bald gentleman sitting bathed in the light of the setting sun dressed in a golden hued silk kurts and red shawl plucking at the strings of the ornate instruments he was playing and looking up at the heavens as if seeking validation from the gods above for the melody he was creating I knew enough to recognize the divine instrument as the Veena carried by Saraswati the goddess of learning and music and the emotion on the face of the Vainika the veena artiste to be one of utter ecstasy. And it fascinated me. He seemed so completely at one with his veena and with the music he was able to coax out of it. Sadly I never god on opportunity to hear him play live since he passed away when I was still too young to start attending concerts. But my acquaintance with him was revisited years later when I saw his smiling visage peering down at me from the wall at my music teacher Dr Jayanthi Kumaresh’s home. Among many other Rasikas who rush up to the stage to congratulate you, some of the millionaires too equally eagerly come to give you a hearty handshake. And quite often, what do they tell you then — ‘I wish I were a musician like you, to serve the musical gods as you do, to lead a peaceful life as you, to enrich and promote our great heritage as you do, and to make so many souls around the world happy as you do!’ In a small innocent way, they are jealous of not you, but the art in you. It is then they confess that at an early age they did try to learn music, but did not and could not pursue it. They feel sad that they could not take it up more seriously ... if the thousands of rasikas, who may be poor and unknown, pay you deep respect and even obeisance publicly, it is the art irt you that they are prostrating before. You are just an agent receiving it. If you are feted and feasted wherever you go all around the globe, it is the art in you that is winning you all such favours. If you are written about, reviewed about, in the print media, it is again the art in you that is being analyzed or extolled, and you are just being ‘instrumental’ to that cause! Of course, the writer in me wished someone had helped Balachander with editing his speeches — they were verbose, hyperbolic and excessive. Ten intense adjectives in every sentence, where one would suffice in conveying the message. But the speech itself struck a chord deep within. At that time, I was battling my own demons with relation to music; a phase of frustration, of disillusionment and hopelessness with regard to the art form that I so revered and was passionate about — a theme that Balachander had dwelt upon in this speech. While this phase is generally considered a significant milestone in every music student’s ‘journey’, the discomfort it caused seemed insurmountable at that time. Which is why at that point, the words of Balachander came like some divine message to soothe my heart. I warmed to the man instantly and my interest in him was not just kindled, but fired! I had known so few Carnatic musicians who could speak with such can dour and forthrightness on matters related to ethics in music. As is my wont, I made an impulsive decision — to explore the life of a man who my own guru had always spoken so highly of. But the time for a biography on Balachander had not yet arrived. I had already been possessed by a project to exhume and recreate the life of Gauhar Jaan, yet another feisty and colorful artiste. Several authors, including me, who have attempted to write on matters related to the arts, and especially the lives of artistes, have often complained of the abysmal lack of source material. Given the Indian anathema to documentation and the self- effacing world of artistes, chronicling the lives of musicians and unearthing their personalities becomes an uphill task. But Balachander was an exception, and, unknowingly, a biographer’s delight! Halfway through his career as a vainika, he made it a point to collect all the assorted materials related to his life and career and paste them in scrapbook ‘albums’, thus building up an enormous corpus of information about himself. By the time he passed away; he had filled eight gigantic albums, containing more than 1,000 pages. To give the reader a sense of Balachander ‘s commitment to documenting his life, each page is made of thick cardboard: 19.75 inches long and 14.5 inches broad. Each volume is bound between covers of very thick resin-lined boards. Some of them are so heavy that only a national-level weightlifter will be able to lift them! These volumes contain cuttings from newspapers and magazines, programme announcements, bit notices, colorful posters of concerts abroad, tourism brochures, titles and honors bestowed on him in his illustrious career, and sundry details of his personal life. They also include a barrage of letters and telegrams that he loved writing to others. He kept a copy of every communication sent and received for his personal records. In addition, he also annotated these clippings with humorous, sarcastic, even bitter, comments — the closest one could get, perhaps, to a personal diary. These albums are probably the most explicit revelations of the man himself, his opinion about himself and his musical career, and the world around him. He was brutal when it came to attacking those inimical towards him and over-effusive while lavishing praise on his friends and confidantes. Sadly, however, the richness and attention to detail that the earlier albums received, tapers down as one gets to the last one, out of a total of eight. By then, Balachander was embroiled in the most unseemly and messy controversy of his life that consumed him entirely. He was waging a lonely battle against what he considered a fabrication of history and the unethical practices prevalent in the world of music. His was an attempt to try and reclaim the very soul of Carnatic music that he felt was getting eroded. The impact of this acrimonious battle is visible in the last album, which just trails away, much like his life itself did. All said and done these albums seem to have served a kind of cathartic purpose for Balachander. Through them he was able to give vent to his feelings uninhibitedly and ease his mind of tensions related to his music career. The candid and forthright nature of the albums the great musician painstakingly created gives a unique and first hand insight into the mind of the man named Balachander. Naturally the albums became the starting point of my journey to writing this book. I have quoted him extensively throughout the manuscript to give the reader a flavor of his persona his passion on matters related to music and his inimitable wit.